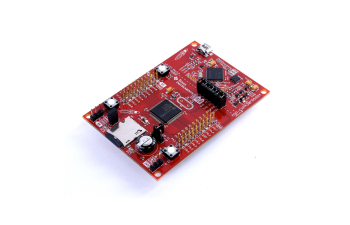 The MSP-EXP430FR5994 LaunchPad™ Development Kit is an easy-to-use evaluation module (EVM) for the MSP430FR5994 microcontroller (MCU). It contains everything needed to start developing on the ultra-low-power MSP430FR5x FRAM microcontroller platform, including on-board debug probe for programming, debugging and energy measurements. The board includes buttons and LEDs for quick integration of a simple user interface as well as two unique features: a microSD card slot allowing the user to interface with SD cards, as well as a super capacitor (super cap) that acts like a rechargeable battering, enabling standalone applications without an external power supply. The 16MHz MSP430FR5994 device features 256KB of embedded FRAM (Ferroelectric Random Access Memory), a non-volatile memory known for its ultra-low power, high endurance, and high speed write access. Combined with the 8 KB of on-chip SRAM, users have access to 264KB of memory to split between their data and code as they see fit. For example, a data logging application can greatly benefit from the fast, low-power writes into FRAM – and all of that without fear data-loss due to loss-of-power. The MSP430FR5994 includes the new Low-Energy Accelerator (LEA). This new hardware module delivers fast, efficient, low-power vector math acceleration commonly found in digital signal processing (DSP) applications. This makes it easy for the MSP430 to process incoming analog data in real-time. With benchmarks that outpace 32-bit ARM® Cortex®-M0+ MCUs by more than 40x, this nimble MCU delivers performance with exceedingly low power consumption. The device also includes a wide variety of integrated peripherals including: communication ports, timers, real-time clock, AES encryption and CRC error-checking accelerators, as well as the included analog comparator and a multichannel ADC with its ultra-low power, window-based interrupts. TI's ULP Advisor provides hints to improving software efficiency while the compiler does its job. Taking this much further, the EnergyTrace++ features let the debugger offer up unprecedented visibility into code execution - in two different ways. First, the LaunchPad kit's debugger hardware keeps track of each micro Joule in time, letting CCS provide detailed graphs of energy usage. Second, the MSP430FR5x/6x MCU gives users a unique look inside the chip - logging the CPU's power states as well as the status of each integrated peripheral. Along with the LaunchPads EnergyTrace++ enabled debugger, rapid prototyping is simplified by the 40-pin BoosterPack™ plug-in module headers, which support a wide range of available BoosterPacks modules. Using these, it’s easy to quickly add features like wireless connectivity, graphical displays, environmental sensing, and much more. To get started, plug the Audio and Sharp LCD BoosterPack modules onto your MSP-EXP430FR5994 LaunchPad kit to run the Filtering and Signal Processing TI Design, which is a good way to evaluate the MSP430FR5994 CPU with the LEA module. Alternatively, with only the LaunchPad in hand, check out how to solve your EEPROM requirements using the TIDM-FRAM-EEPROM TI Design. Free software development tools are available, such as MSP430Ware, TI’s Eclipse-based Code Composer Studio™ (CCS) and IAR Embedded Workbench. As well, both of these IDEs support EnergyTrace++ technology for real-time power profiling and debugging when paired with the MSP430FR5994 LaunchPad kit.